The reasons one buys an older car are as varied as the cars and the people who own them. In the case of Dan Skidmore’s 1950 Studebaker Land Cruiser, his motivation for buying the machine was to save it from “the crusher.” For $100 he was able to tow the remains of the car home and had visions of starting a restoration process on the car. This is not an unusual vision for an auto aficionado and Skidmore had an understanding of what he was getting into. As the restoration project began, he found the car was a bit rougher than imagined. “Every time you peel a layer off the onion you find another rotten apple,” he remembered. After much work, he found he had taken the car down to the bare nuts and bolts. As the car was being taken apart, Skidmore would document the process with photographs for a variety of reasons - one of those is simply to create a photographic memory of the vehicle but the other was to mark where things were placed by the factory. Dan Skidmore also found his family becoming interested in the project, with family members watching and later becoming part of the restoration project. Dan’s wife ultimately crafted a grab handle for the back of the front bench seat and his grandson also put in hours on the project. So what kind of work is involved in completely restoring a car like this? A lot of detail. “This is a project” said Skidmore as he gently closed the driver’s door, resulting in a smooth click. “That’s the way they came from the factory. I put it as near as I could in original factory condition.” Among the things he found as he disassembled the car was the care put into things by the factory like the headliner. Like other auto aficionados, he has more than just one car. For example, there’s a ’63 Studebaker wagon that has been on display at the Petersen Automotive Museum in Los Angeles. Skidmore also has an Avanti. 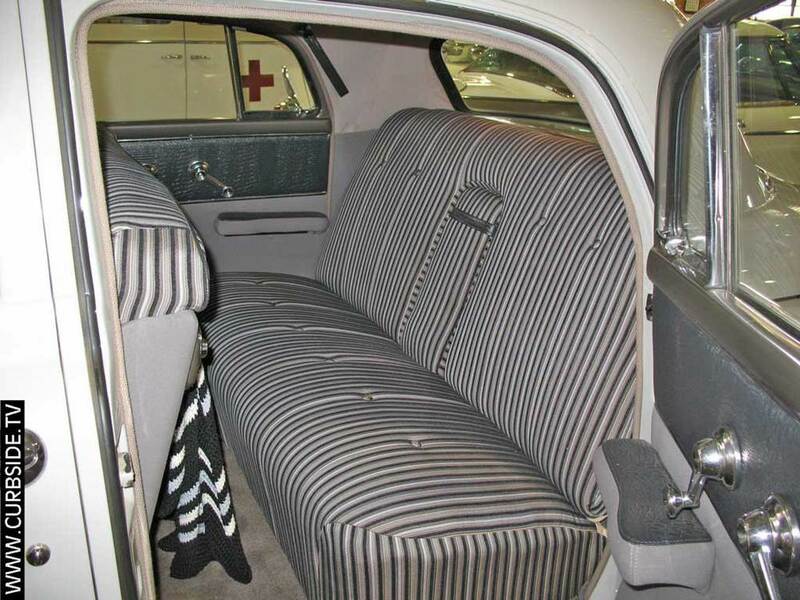 Studebaker was a company that was known for its innovative features. For example, if you’re going more than 5mph you can move the transmission selector lever into any position and it won’t actually affect the transmission. The automatic also has direct drive in third gear. “It bypasses the transmission” which makes it more efficient. 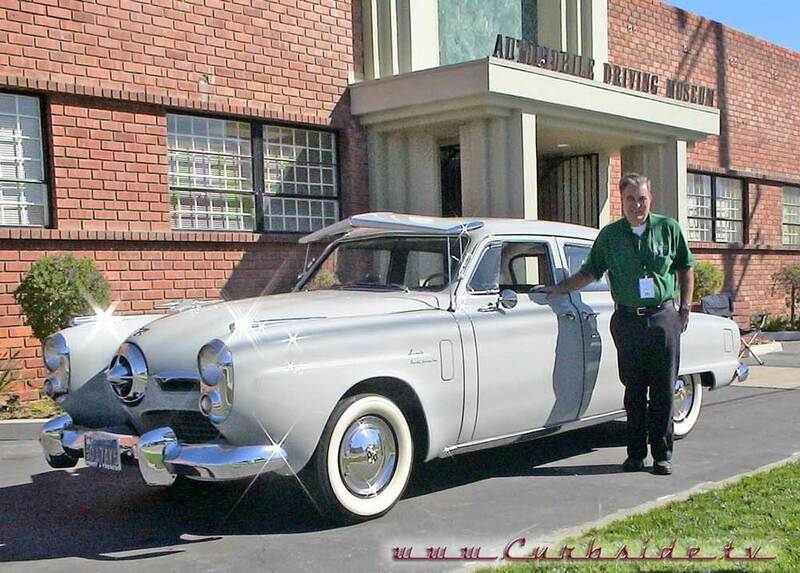 1950 was the first year for Studebaker automatics. There’s also an anti-creep feature in the automatic transmission so you can sit at a stop light with all your feet off all the pedals. 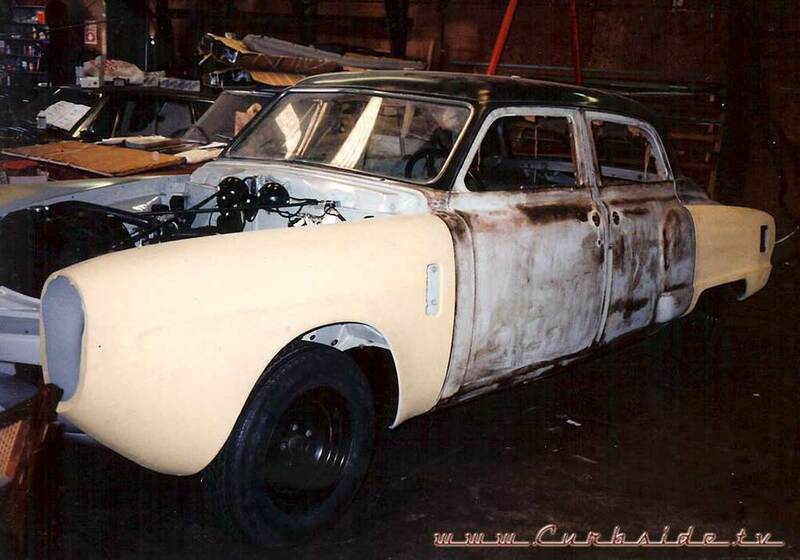 As for finding the parts needed for such a detailed rebuilding of a car like this, Skidmore indicated that all the parts are still available through a Studebaker club. He’s quite an advocate of belonging to a car club for anyone who has a vehicle of historic nature. While most car companies were just getting their start in the late 1800s and early 1900s, Studebaker had already been in business for decades. The H & C Studebaker blacksmith shop opened in 1852 at the corner of Michigan and Jefferson Streets in what is now the heart of downtown South Bend, Indiana. Henry and Clement Studebaker’s blacksmith shop would turn into the Studebaker Manufacturing Company in 1868, and would eventually become the largest wagon manufacturer in the world. Studebaker would also be the only manufacturer to successfully switch from horse-drawn to gasoline powered vehicles. Clem, Henry, J.M. Peter and Jacob John Mohler Studebaker returned from California in 1858 where they made wheelbarrows for gold miners, and invested their earnings in the business. The brothers were filling wagon orders for the U.S. Army, and would continue to do so throughout the Civil War. By 1887, sales would eclipse two million dollars, and by 1885, production would top 75,000. By 1902 the Studebaker brothers were producing electric cars, and their second one was sold to an inventor named Thomas Edison. By 1904 they saw the writing on the wall and began producing gasoline-powered automobiles. Like many automobile manufacturers, Studebaker made military vehicles during World War II but new styling marked Studebaker’s return to automobile production after the war, unlike other manufacturers who simply began producing warmed-over pre-war models. In 1950 Studebaker introduced the “bullet nose” styling that makes cars like Skidmore’s so recognizable. Studebaker continued production of passenger cars until 1966 at which time they stopped production and focused on other businesses. One of the nicest things about Dan Skidmore’s car is that it’s possible to actually enjoy a ride in it. Like other cars housed at the Automobile Driving Museum in El Segundo, CA it gets in the rotation to be driven on Sundays for visitors to the museum. If you experience a glide along the boulevard in this smooth, classy example of Studebaker engineering and style and you’ll likely have Dan Skidmore as your chauffeur, meaning a good dose of history and information from this driving docent. And that would make such a Sunday drive a wonderful experience. We would love to feature your car right here on the Curbside website. Simply let us know how to contact you and we will be on it!